The deal would rescue a sinking Pacific Rim Mining, but for Salvadorans it’s raising fears. Prolonging the unjust arbitration process will cost El Salvador, which is the smallest and most densely populated country in Latin America, millions of dollars. The OceanaGold bailout of Pacific Rim makes enacting a ban on mining in El Salvador even more urgent. Despite the acquisition, opposition to mining in El Salvador is widespread (and justified). Pacific Rim Mining shareholders approved selling their company to Australia’s OceanaGold for $10.2 million on November 21. The new owner will inherit legal and human rights troubles in El Salvador and all of Latin America. Since 2009, Pacific Rim has been suing El Salvador for not having granted it a mining permit since a presidential ban on mining was adopted, despite widespread opposition to mining across the country. The deal would rescue a sinking Pacific Rim Mining, but for Salvadorans it’s raising fears. Prolonging the unjust arbitration process will cost El Salvador, which is the smallest and most densely populated country in Latin America, millions of dollars. “If it comes down to it, I think it is better to pay the money, than to pay the consequences,” Archbishop Alas said. He’s referring to the devastating environmental and health consequences of mining in a country where 90 percent of the surface water is heavily contaminated and 20 percent of its rural population lacks safe drinking water, according to the World Bank. With El Salvador experiencing a clean water crisis, reopening the country to mining would threaten two-thirds of the Salvadoran’s water supplies, affecting health, agriculture and livelihoods. “Despite Pacific Rim’s claims that OceanaGold is a good environmental and social steward, its gold and copper operation in the Philippines has been devastating for local communities. In 2011, the Philippine Human Rights Commission recommended the revocation of OceanaGold’s mining license, citing forcible and illegal demolitions, the harassment of residents, and the indigenous community’s right to culture. [i] Residents have complained of “dirty water” downstream from the open-pit mine operation and of dead fish washing up on the shore. Christina Hill from Oxfam Australia’s mining campaign also called on OceanaGold to drop their unjust law suit and respect Salvadoran sovereignty to act in the public interest. “Concerned Australian citizens and social organizations have already started a public education campaign to denounce OceanaGold’s acquisition of Pacific Rim’s El Dorado project and to demand that Pacific Rim drop its suit against the government of El Salvador,” the International Coalition press release further explained. “While in Australia, OceanaGold shows its best in their Annual Sustainability Report. In the Philippines, where one of its largest mines is located, the reality is different. Up to now, there is no evidence that this company would behave differently in El Salvador,” said Vladimir Pacheco, Salvadoran environmental leader living in Australia. The OceanaGold bailout of Pacific Rim makes enacting a ban on mining in El Salvador even more urgent. 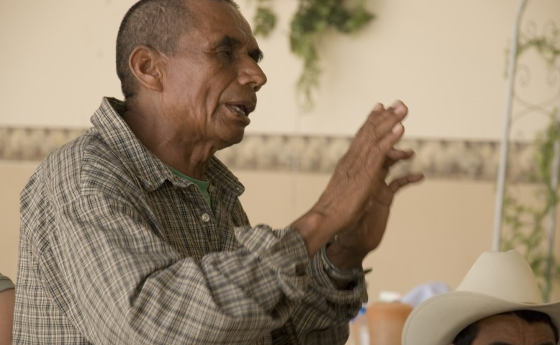 Oxfam America is working with local partners and communities in El Salvador to support their right to determine whether they allow mining in their country. Home states and international institutions should also respect the environmental, cultural and health concerns of citizens. Alex Blair is the press officer for Oxfam America’s Extractive Industries team. You can find out more about mining in Latin America by visiting Oxfam America’s extractive industries campaign. [i] Philippine Human Rights Commission calls for end to mining deal, Published by MAC on 2011-01-25. Source: Bulatlat, GMANews.TV, Reuters (2011-01-20).